The community at Saint Andrew’s Episcopal Church has just started a Shakespeare Reading group, with me as the official Shakespeare Mentor. Tonight, 13 of us met to read Midsummer Night’s Dream together. Melita Thorpe hosted the event and organized the pot luck supper. 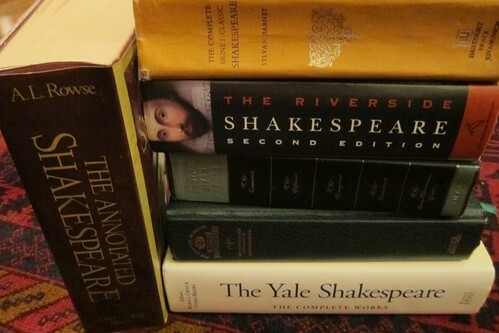 As the Shakespeare Mentor, I recommended MSND movies to watch in advance, sent out an email with background on the play and recommendations for how to read Shakespeare, brought texts to read from, and distributed roles for the evening. My favorite MSND films are those of 1935, 1968, 1996, and 1999 (see details on the Midsummer Night’s Dream wikipedia page section on films). Shakespeare wrote play scripts – not literature – reading a Shakespeare play is entertainment and you should enjoy yourself! Trust the punctuation – pause not at the end of a line or at a rhyme but only at the period ending the sentence. Read as quickly as you can using a normal tone – no special accent is needed for most roles. Keep going – do not pause between speeches or scenes – the characters should sound like they are responding to each other. If there is a word you do not know, give it your best guess and go on (or you can ask for advice!). The gender of the role and of the reader do not have to match – remember that Shakespeare had an all-male cast. If the lines in your script do not match the lines in someone else’s, don’t worry about it – Shakespearean scholars don’t always agree on the text – just keep reading. Everyone enjoyed the evening – several of the readers made us all laugh. I am looking forward to future meetings!